The new theme is "Save the Unicorns" and, as usual, there are new items in the Market. 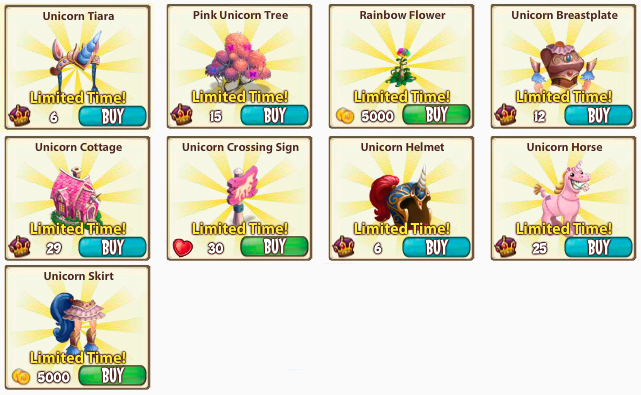 Rainbow flower and Unicorn Skirt are the only items bought by coins. There is one item (Unicorn crossing sign) that cost reputation hearts (30 hearts). Now Pavilion can be used for Unicorn Parties. 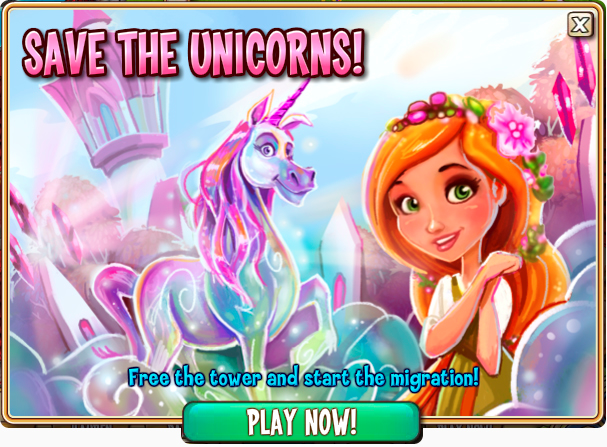 Save the Unicorns so the great Unicorn Migration can begin! 1) Introduced the new Unicornicopia Questline. 2) Added a Unicorn Party. 1) World has been changed to accomodate new Questline. 1) The Dousing the Flames Quest now counts Stored and Inventoried Moats towards progress. 2) Other miscellaneous text and display errors.